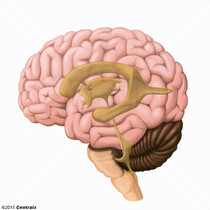 Narrow channel in the mesencephalon that connects the third and fourth ventricles. Cavity in each of the cerebral hemispheres derived from the cavity of the embryonic neural tube. 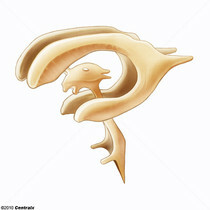 They are separated from each other by the SEPTUM PELLUCIDUM, and each communicates with the THIRD VENTRICLE by the foramen of Monro, through which also the choroid plexuses (CHOROID PLEXUS) of the lateral ventricles become continuous with that of the third ventricle.